Do you recall posing for the photo above? 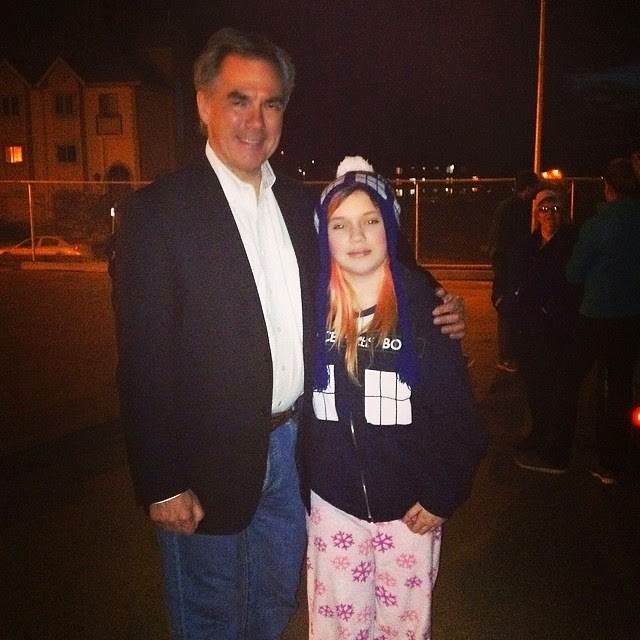 Maybe you do or maybe you don't, but that is from the night you visited the annual Hope in the Dark awareness-raiser in Fort McMurray - and that is my daughter standing next to you. As you recall my daughter sleeps outdoors in a park one night every year to raise awareness about homelessness in our community, and you may remember she is pretty passionate about it. That's just the kind of kid she is, you see. I suppose that's why she is one of the founding members of her school Gay-Straight Alliance, too. This evening I sat with my daughter and I explained Bill 10 to her. I explained the process of an appeal to the school board for students who are denied the opportunity to found a GSA as she has helped to do, and how if the school board refuses to support a GSA the next step is a judicial review. I asked her if she understood what that meant and she shook her head. I asked her if she would know how to find legal counsel or begin an appeal to a school board and again she shook her head. I asked her if doing these things would require the assistance of an adult, and she said yes, of course. And then I asked her if she thought all students had adults in their lives who would assist and support such a course of action - and Premier Prentice, I can't even begin to describe the crestfallen look on her face as she realized Bill 10 essentially means that kids like her who meet opposition to founding a GSA will simply not be able to overcome the challenges and the idea will slowly wither and die. Premier Prentice, my daughter worked on the election campaign for one of your MLAs in this region. And I will be frank with you - my kid is the kind you want on your team, the kind who is performing at the top of the game academically both provincially and nationally (in fact she was just recognized for her academic achievement on her Grade Nine Provincial Achievement Tests). She is the kind of kid who was recognized by our local Chamber of Commerce as an X-ceptional Kid in our region, and she was recently shortlisted as a national finalist of the Everyday Political Citizen contest in the youth category. She is articulate and passionate, she is fierce in her loyalty to those who earn it, she believes in the future and progress, she plans to study engineering physics and forge a path for other young women like her and she is the kind of kid every politician should want on their team - but today you lost her, and possibly forever. In fact I feel as if you abandoned her, just as you did with all the other students like her in this province. Perhaps you think she doesn't count as she is only 15 and cannot yet vote, but she will be able to, and soon. Or perhaps you think her thoughts are immaterial because of her youth and yet I would argue her thoughts and beliefs are the very ones to which you should be paying attention, because GSAs are about her and her peers, not about you and me and ours. We talked a bit about that visit you made to Hope in the Dark, and your conversation with her. You see the last provincial leader she admired is your predecessor, someone who fell so far from grace that the loss left an indelible mark on my daughter's heart. She had been a believer in her, too, and when that ship sank I could see some of my daughter's belief in politicians go down in the swirling waters the sinking left behind. Today I saw it happen again as she recalled how you bent down and spoke to local youth about their participation in the event, and how you posed for that photo with her. Today she felt abandoned by someone she believed would be there to represent her and all the kids like her, kids who are gay and straight and transgender but who are most of all just kids in need of support and assistance when perhaps there will be no other adult who will be there for them. Some of those kids won't have a supportive school board like she does. Some of those kids won't have the supportive teachers she has and some may not even have supportive parents. Premier Prentice, you could have been the one support those kids had, the one who could have prevented depression, bullying and suicide by ensuring those students were able to provide support and encouragement to each other - but today it seems you joined the ranks of those who do not and will not support our youth when they need it most. Today I think you lost my daughter, Premier Prentice. And if you lose her you have lost me too, because I cannot find a way to support someone who would consider abandoning her and kids like her. I am so sorry it has happened, too, because I look at the photo above and I see such promise and possibility. I see such hope for the future. But as I looked into her eyes tonight I realized the hope and promise and possibility may not be meant to be. Maybe it is too late to change Bill 10. Maybe it is too late to undo what you have done, but if there is any chance I implore you to embrace it, because perhaps there is still a chance to make my daughter have faith again. I don't know if either is possible or if either has a chance - but I dearly hope it is, because what comes before all else to me is that young woman in the photograph above, and I will do anything to support her and what she believes in, because that young woman? One day she hopes to have your job, Premier Prentice. Today I think she thought a great deal about the kind of leader she already is - and the kind she does not want to be. Well said and well written. I hope Bill 10 is repealed for the sake of all those kids who would not/do not have the same support as your daughter does. Redford was betrayed by her Caucus. Prentice has no such excuse. He is a Conservative, which is not inclusiveness. It is in fact exclusiveness.